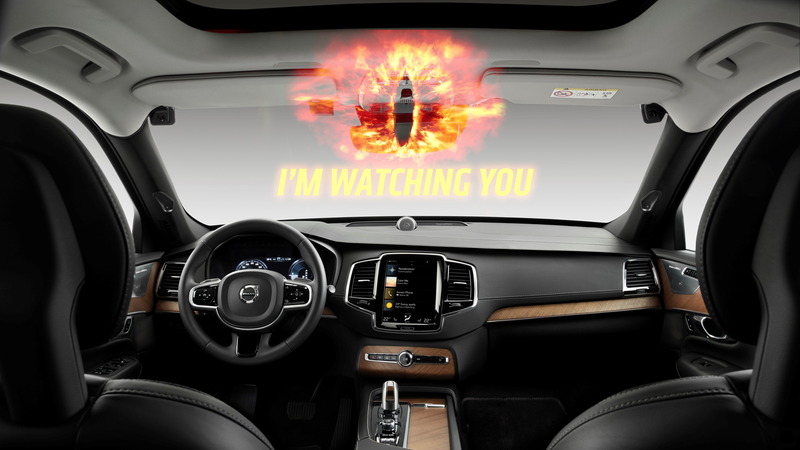 Volvo is very committed to the idea of ending all fatalities in cars it builds, and it’s even willing to watch you like a hawk and snitch on you to make that happen. Volvo announced today it will employ in-car cameras to detect when a driver is drunk or distracted, and its cars will take specific actions when such a system is detected. I suspect you can also trigger the system by just driving like a loon, but I guess we’ll just have to see. The proposed interventions include audiovisual warning signals, reducing the car’s speed, alerting the Volvo on Call assistance service, and finally actively taking control of the car to pull it over and park it safely as quickly as possible. It’s not the first driver-assistance system to use an in-car camera. Cadillac’s Super Cruise, for example, also employs a camera that watches the driver’s face and eyes to monitor for distracted driving. Volvo’s camera system appears to be checking for a few key criteria, including eye motions, whether the eye is actually open or not (generally, open is the preferred option for driving), extreme steering or braking reaction times, if the car is weaving or driving erratically, if there’s no steering input at all, or if the driver is just slumped over and sloppily passed out on the dash. They’ve even made an overcomplicated chart for something we all know: the more drunk you are, the worse you’ll drive. There’s a lot of good ideas here, and, potentially, a system like this really could save lives, and that would include situations beyond intoxicated driving like fatigued driving or distracted driving. My only concern would be whether the information from different sensors can be used to reliably classify the driver’s state as impaired or not impaired, distracted or not distracted. You would want to be completely certain that the driver is in an impaired state before forcing the vehicle to slow down and safely park itself. Basically, how well will this work? Will it deliver a lot of annoying false positives if I have allergies and keep sneezing or am dancing in my seat because Radar Love came on? Will driving while being constantly watched and monitored be something I even want, just conceptually? There’s also the tricky question of whether or not your car will narc on you. If the car does determine you’re likely impaired, after Volvo on Call is contacted, will law enforcement be contacted as well? While this could be a prudent course of action, why would I want to buy a car that would snitch on me? I’ve reached out to Volvo for comment on this, and will update when I get a response. Volvo says the system will appear in cars starting in the 2020s. So, if you want a Volvo but do a lot of weaving, strange blinking, and slump in your seat when you drive, you should buy your Volvo before then. So, there you go. Your car won’t get you into legal trouble.